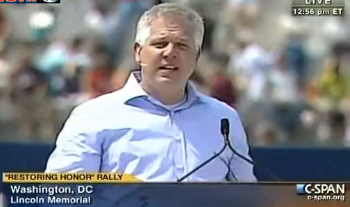 On his Fox show on September 2nd, Glenn Beck pointed to one blogger who he felt truly understood his Restoring Honor rally. It's worth examining in detail to best understand what Beck wants the country to think he was doing and to pose questions or counter-assertions as warranted. The original post, "I think I see what Glenn Beck is doing," by Lexington Green is in black. It was published on Chicago Boyz. The Review commentary is in blue. The Glenn Beck rally is confusing people. He is aiming far beyond what most people consider to be the goalposts. Using Boyd’s continuum for war: Material, Intellectual, Moral. Analogously for political change: Elections, Institutions, Culture. Beck sees correctly that the Conservative movement had only limited success because it was good at level 1, for a while, weak on level 2, and barely touched level 3. Talk Radio and the Tea Party are level 3 phenomena, popular outbreaks, which are blowing back into politics. These "popular outbreaks" are two different matters. Talk radio was "blowing back into politics" with Rush Limbaugh cheering on his fellow reactionary, Newt Gingrich, in 1994 when the Republicans took the House of Representatives back from the Democrats. In short, there is nothing new about the blow back from talk radio. The Tea Party is a popular outbreak largely supported and funded by the Koch brothers, petroleum industry billionaires whose father help found the John Birch Society. They fund Americans for Prosperity who in turn fund the Tea Party Express. It is a reactionary, grass roots movement backed by astro-turf funding by the ultra-wealthy who are pleased to have a people supporting their reactionary, anti-government agenda. Someone who asks what the rally has to do with the 2010 election is missing the point. Perhaps it's Green who's missing the point of the Black Robe Republican Regiment, the brain child, according to Beck, of David Barton, a historical revisionist, whose mission is to tear down the wall separating church and state. Elements of this Regiment are organizing their base for this year's mid-term elections. Solidarity? Solidarity with whom? Beck and Barton are working to strengthen the far right into a cultural and political force that undermines the Constitution, specifically when Beck argues with the majority who oppose the construction of the Park 51 Cultural Center near Ground Zero. The vision of cultural confidence in America, our Constitution, our military and our freedom are not (with exceptions) despised by mainstream Americans at any height of our culture. That is a myth perpetuated my Mr. Beck as part of his anti-intellectualism, anti-elitist propaganda. If Beck were truly interested in unity, if he were a uniter and not a divider, he could have asked Rev. Sharpton to speak at his rally and combined the NAN sponsored march with the Restoring Honor rally. The "enemy" to which Mr. Green refers are fellow Americans. Referring to Americans who don't embrace Beck's reactionary ideals as "the enemy" is un-American. Differing political factions, reactionary, conservative, liberal and radical, are NOT enemies; they are opponents. Beck's efforts to "change the foundation" serves the interests of corporate America and the reactionary (Libertarian) philosophy of anarchic enterprise, and opponents of that philosophy have every bit as much patriotism and love of country as those in other camps. Finally, the idea of "independence" is a myth, an ideal of yesteryear that Beck often hearkens back to. We, as individuals and as a nation are inter-dependent upon each other and on people in other nations. This is called the division of labor. Beck is unabashed that God can be invoked in public places by citizens, who vote and assemble and speak and freely exercise their religion. They are supposed to be too browbeaten to do this. Gathering hundreds of thousands of them to peaceably assemble shows they are not. But showing that the people who believe in God and practice their religion are fellow-citizens who share political and economic values with majorities of Americans is a critical step. The idea that these people are an American Taliban is laughable, but showing that fact to the world — and to potential political allies who are not religious — is critical. The idea that religious fundamentalists represent an American counter-part to the Afghanistan Taliban is not laughable to Markos Moulitsas and other people on the left who see many on the far right as similar in several regards to the jihadists. Hopefully the main point of distinction between these factions, i.e., Beck's request to have his flock sign a pledge of non-violence, is embraced by all on the American side. Non-violence and tolerance are hallmarks of our pluralistic system of government. Let's hope it stays this way. He is nuking out the foundations of the opposition’s moral preeminence, the very thing I proposed in this post. Green's continued effort here to mark those who disagree with Mr. Beck as "enemies" sounds like something the Afghan Taliban would agree with in their society. American progressives and American Libertarians are not enemies, and Mr. Green is deceitful and un-American to paint the differences thus. That kind of language can be used by the mentally unstable to rationalize violent acts. Many believe that our society is unjust, and the idea of institutionalizing social justice is one response to it. Reversing 100 years of federal legislation that protects the American people from the excesses of corporations would be the opposite of justice. This is what Beck is "nuking" or at least trying to destroy. Beck is prepping the battlefield for a generation-long battle. He is that very American thing: A practical visionary. Reversing 100 years of federal legislation that protects the American people from the excesses of corporations would be the opposite of vision unless you're looking in the rear-view mirror. Restore pride and confidence to your own side, and win the long game. This is the language of division. What about restoring pride and confidence in all Americans? Why did this have to be about only faith, hope and charity? Why not add a more inclusive values such as reason, truth and justice? Incidentally, there is not much hope that Glenn Beck will stop deceiving his listeners and tell the truth, the whole truth and nothing but the truth. His linking of hope with truth is an hysterical example of Beck's hypocrisy. Once again, Beck is not the man to attempt to restore honor anywhere because someone who is a liar and a hypocrite has no honor to start with. As Ronald Reagan also said, there are simple solutions, just no easy solutions. If Beck's reactionary Black Robe Republican Regiment is successful, if Beck's rally is a turning point against the middle and under classes, a successful move against the public interest in favor of the corporate interest, then God help America.